Just a few months back Little Debbie introduced super tasty chocolate Cosmic Cupcakes. For summer there's an even more delicious and fanciful Summer Seasonal Snacks lineup of sweet snacks the whole family will enjoy. 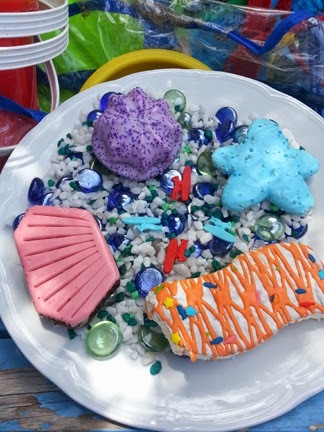 Five new colorful beach theme delights both kids and kids at heart will appreciate are on store shelves now: blue Starfish Cookies, pink Seashell Brownies, lavendar Jellyfish Cookies and white/orange Coral Reef Cakes in both vanilla and chocolate flavors. These cookies and cakes are truly unique in shape and color, very appropriate for the warm and sunny season we're all currently enjoying. Who can resist these pretty treats? Besides these are individually packaged so they stay soft and moist until you're ready to eat them. And the aroma of a newly opened treat is so powerful... the minute I unwrapped one , our two little Yorkie Terriers Max and Yoda came running, hoping to get some. But don't worry, I didn't give them any because these are just for humans young and old -- kids and big kids of all ages. Visually these are a feast for the eyes. Not only are these fancy treats delicately decorated with great details, their soft pastel colors are just the thing for summer. These are perfect to bring in your suitcase on an August family vacation, as well as to bring to the beach to savor as you enjoy the sand and surf. They also can be served both every day and at casual and formal get togethers, BBQs, baby showers, birthday parties and even weddings. For sure, these will likely be the center of attention on the dessert table if you happen to be hosting a summer luau. Speaking of summer ocassions, think of the many friends that would give you thumbs up when you bring them to a bonfire gathering, to the park or a backyard hangout with your child's friends. Taste wise these limited edition Little Debbie summer treats are sweet, but not overwhelmingly so. 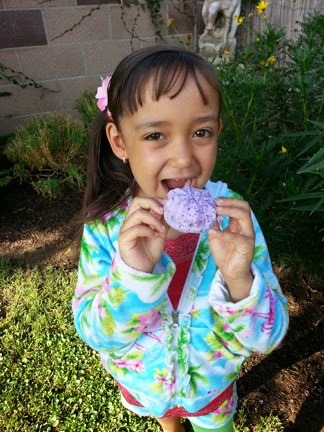 My favorite variety is the Jelly Fish cookies (must be the marshmallow that I love so much!) and my second fave is the Shortbread Starfish Cookies. Not surprisingly, adult preferences do differ greatly from children's. 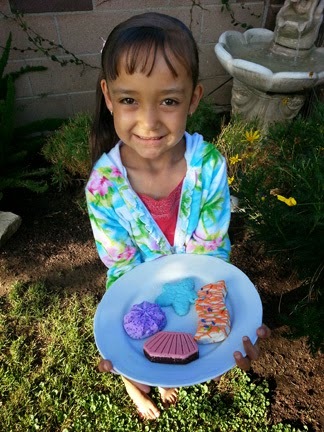 My daughter Sarah has her own best picks: the Seashell Brownies and the Coral Reef Cakes (I'm guessing it's the icing, since it seems that's what little kids love most). The fact that they are individually wrapped in single portion sizes make these so convenient to give to kids for a special treat. Imagine the face of your child when they open their lunch bag and find a Little Debbie treat inside -- this is one item I bet they won't be trading with their friends! Old-fashioned McKee Family Bakery of Collegedale, Tennessee, the makers of Little Debbie, has been baking sweet treats since the Great Depression. Today, true to their humble roots, the brand continues to outdo themselves with fun new and creative family friendly snack cakes and treats that are also affordably priced. The Little Debbie Summer Seasonal collection is available now nationwide. Check the company's store locator for the location to buy these nearest you. Stay up to date on everything Little Debbie is doing by visiting LittleDebbie.com and following them Facebook, Twitter and Pinterest. 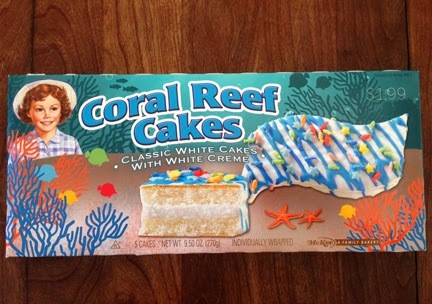 FTC Disclosure: Little Debbie has compensated MommyBlogExpert to facilitate a series of MBE posts about the brand and has provided product for review. All opinions in this post are those of MBE. 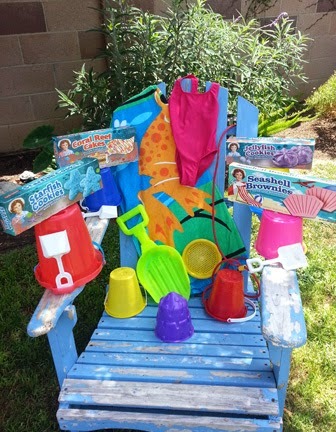 The brand is also providing the prize package and shipping for the associated Little Debbie Case of Summer Seasonal Snacks Giveaway MBE is hosting. See complete FTC Disclosure information that appears at the bottom of MommyBlogExpert's main page and at the bottom of every individual post on this blog, including this one.